“When Mom Was My Age” is an interview series between daughters and mothers. New interviews appear every Monday (usually!). If you would like to participate, contact Jane. 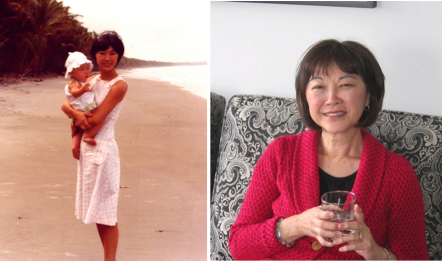 The following interview is with Joanne Shimotakahara, interviewed by her daughter Leslie Shimotakahara (age 32). 1. Tell me about where we lived when you were my age (32). We lived in Port of Spain, Trinidad, because Daddy was on assignment at ISCOTT (Iron and Steel Company of Trinidad and Tobago) from 1978 to 1980, about two and a half years. 2. Tell us about where you worked and what a typical day was like. I wasn’t allowed to work as a speech-language pathologist (or anything else) in T&T. In fact this restriction was stated in my passport. There was only one SLP on the island of three million people at that time. I looked after you from the time you woke up until you went to bed. You became overly bonded since we saw only Ruth Forsythe, whose husband was Daddy’s boss, on a daily basis. The Forsythes lived next door. I observed and supported your communication development with a small number of toys, story books, lots of interactive songs and finger plays. Once a week I had the car and would take you on an outing to the Hilton Hotel where we had lived for the first five weeks in the country. The staff knew you and were very friendly. After several months I met some other mothers with toddlers of your age and organized a weekly rotating play group. Whoever hosted the play group made lunch for everyone, which required shopping in advance for scarce grocery items and pre-cooking. 3. What did you most worry about? I worried about losing my career, which was my second career after teaching. I had only worked two years after graduating as an SLP and wondered if I would be able to get back into the profession. I was also concerned that you didn’t know your family— grandparents, aunts, uncles—and we had very few friends, more like situational friends who were expatriates like us. Although I had my professional journals and some books, there was only one hour of television daily in the morning and only one radio station. There were frequent hydro outages which affected the water purification plant. Fortunately, Daddy had negotiated a large supply of Pampers for you. Otherwise I would have been hand-washing diapers! Living in Maraval, near the embassies on Golf Course Road, our house was at risk for break-ins. We lived within a compound wall with wrought iron grillwork on all of the windows. The Lebanese landlords who lived upstairs had a German Shepherd guard dog. Fortunately, we had no break-ins. 4. Looking back, what did you think the future held? We expected to do well when we returned to Toronto, although Daddy was worried that he might not get promoted as usual after an overseas assignment, since he lobbied the company to allow us to return home after three years. The company wanted us to stay for five years, longer than had been agreed upon initially. We had done well financially and, on our return, sold our Brookdale house and moved to the Glenforest house. I expected to return to my profession part-time and enroll you in a preschool program to provide you with group experiences before kindergarten. 5. How do you look back on those times now? Although living in T&T was challenging, isolating and uprooting to our small family, in retrospect, the experience was extremely valuable. We experienced a totally different culture. I really valued being Canadian and having a career, family and friends once I lived in a situation where no one seemed to know we existed and life was full of casual acquaintances. We kept in touch briefly with the Montgomerys and the Forsythes for a few years but lost contact once our lives returned to normal. There seemed to no reason to cling to each other any longer and yet I was grateful to have known the friends we met in T&T. I often thought this must be what it’s like to be retired. Now that I am retired I have transitioned quite easily into this new phase in part because I had the experience of being relocated and having to adjust to new circumstances. My earliest memories are of Golf Course Road, where our house in Trinidad was located. When I close my eyes and think back, I can see the wrought iron grillwork on our windows and the jittery horizon at sunset, as you were pushing me in my baby carriage along the unpaved road. Your reflections on how isolated and worried you felt resonate with me particularly because of my own struggles a couple years ago. After finishing my Ph.D. at Brown, I moved to a small town in Nova Scotia to accept a job as an English professor, but what I’d envisioned as my dream career left me feeling depressed and culturally isolated. Over my two years there, I gradually came to terms with the fact that I wanted to leave academia and pursue my original childhood dream of becoming a writer. My mother was very supportive during that time and she often mentioned her own days in Trinidad as an example of how she had overcome isolation and struggled to find happiness and hope in her future career. A couple years ago, I followed my gut instinct and my mother’s advice and returned to Toronto to pursue writing. My memoir, The Reading List: Literature, Love, and Back Again, is being published next fall. At my blog, I reflect on the novels that have inspired and uplifted me at crisis points in my life, and mother, from time to time, is known to comment.